The M1911 is a .45" caliber, single action, semi-automatic handgun, originally designed by John Browning, which was the standard-issue handgun in the combat arm of the United States Armed Forces from 1911 to 1985. The weapon had its origins in problems encountered by American units fighting Moro insurgents during the Philippine-American War in which the then-standard .38" caliber revolver was found to be unsuitable for the rigors of jungle warfare. The Army formed an Ordnance Board, headed by John T. Thompson, to select a more suitable weapon. The board decided a .45" caliber weapon would be most appropriate, and took bids from six firearms manufacturing companies in 1906. Of the six designs submitted, two were selected for field testing in 1907, one of them being Colt's model, which Browning had basically modified to government specifications from an earlier autoloading .38" caliber design of his. A series of field tests was designed to decide between the two finalists (the other being a design by Arthur Savage) and the Colt passed with flying colors, firing 6,000 rounds non-stop (a record at the time). The weapon was formally adopted by the Army on March 29, 1911, thus gaining its nomenclature. It was adopted by the Navy and Marine Corps in 1913. 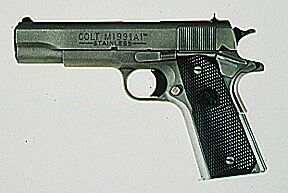 Originally manufactured only by Colt, demand for the firearm for use in World War I saw the expansion of manufacture to the government-owned Springfield Armory. Battlefield experience in the First World War led to a redesign of the weapon, completed in 1926, and named the M1911A1. Changes to the original design were exceedingly minor (shorter trigger, recess near the trigger frame, etc. ); for this reason, those unfamiliar with the sidearm are often unable to tell the difference between the two models at a glance, and also for this reason those familiar with the weapon consider its design one of the most effective in the history of firearms. The soundness of design is also borne out in its longevity of service (over 70 years). World War II and the years leading up to it created a great demand for the weapon, which in turn led to the Army's extending manufacturing contracts to several manufacturers, including Remington Rand, Ithaca, Union Switch and Signal Company, and Singer (the sewing-machine manufacturer), as well as the Springfield Armory and Rock Island Arsenal. After the Second World War, the sidearm continued to be a mainstay in the U.S. armed forces, seeing action in the Korean War and the Vietnam War (where it was the weapon of choice for U.S. "tunnel rats"). It was replaced, largely due to considerations of NATO commitments, with a 9mm sidearm, the M9, on January 14, 1985. The M1911A1 is still used by special operations units of the U.S. Army, Navy, and Marine Corps, and by Hostage Rescue Team units of the FBI, among other agencies. The M1911A1 design is also favored by police SWAT teams throughout the United States. Today the M1911A1 type is widely used by the general public in the United States for both practical and recreational purposes. The pistol is commonly used for concealed carry, personal defense, target shooting, and competition. Numerous aftermarket accessories allow the user to customize the pistol to his or her liking. There is a growing number of manufacturers of 1911A1-type pistols and the model continues to be quite popular for its reliability, simplicity, and All-American appeal. Various tactical, target, and compact models are available. Price ranges from a low end of $250 for an imported "clunker" to more than $3,000 for the best competition or tactical models, which are precisely assembled and tuned by hand. Despite being challenged by more exotic and lightweight (and largely imported) pistol designs in .45 caliber, such as the Glock 21 and Sig Arms P220, the original 1911 design will soon be 100 years old with no signs of decreasing popularity. The weapon typically uses a variety of 230-grain full metal jacket ammunition also originally designed by Browning, with a normal capacity of 7 or 8 rounds, or even more with larger aftermarket magazines.